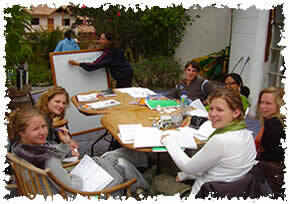 The Spanish Language School in Buenos Aires, Argentina offers the exceptional opportunity to study Spanish while immersed in Argentine culture, in stunning en exciting Buenos Aires. Our School in Buenos Aires is situated in in the beautiful Barolo Palace in the city center of Buenos Aires, at a few minutes only from well-known spots of the city, such as the Obelisk, the National Congress and the Pink House. Other activities, such as Tango classes, workshops on Latin American Culture and extra daily Student Activities, make our Spanish school a distinctive educational destination in this incredible city in Latin America, filled with Spanish language, excitement and culture. Buenos Aires is said to be the "Paris of South America" with a European influence and charm combined with a Latino flare! Cosmopolitan Buenos Aires is known for its beautiful architecture and the tango which originated in the brothels of the city in the 19th century. It has 48 diverse districts, or barrios which include, La Boca, an Italian neighborhood with brightly painted houses, San Telmo with its flea markets and tango avenues, and Palermo, an area filled with parks, great restaurants and bars. A city rich with culture, the perfect place for Spanish immersion, Buenos Aires yearly receives more than 5 million tourists coming from all around the world, of which 24,000 come exclusively to learn Spanish! This city has something for everyone, making it the best destination when looking to learn Spanish and experience a new language and it’s culture! Buenos Aires will dazzle you with its sophistication, the exuding warmth from the people, the charm of the Tango and the beauty of the Spanish language. Learn Spanish by choosing the best of our Spanish programs: Spanish for kids, Spanish for travellers, medical Spanish, Spanish and volunteer work, or Spanish and excursions. Unique: different Spanish schools in Latin America to mix and match; book now: Spanish lessons Buenos Aires & Bariloche; Spanish in Buenos Aires & Cusco, Peru; Spanish in Buenos Aires and Montevideo.